You'll love this rustic oatcake recipe - crispy, thick and full of wholegrain oats! 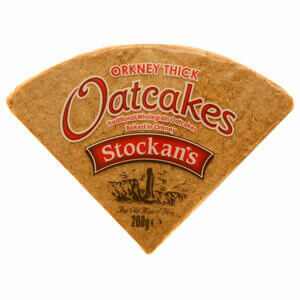 Stockans from Stromness, Orkney hand bakes these thick hearty quarter round oatcakes. Each 7 oz. package holds eight 3.5" wedge shaped oatcakes. Perfect with cheese, marmalade, jam, honey or just plain. Ingredients: Wholegrain oats(78%), vegetable oil, fortified wheat flour, sugar, salt and raising agents(potassium bicarbonate). 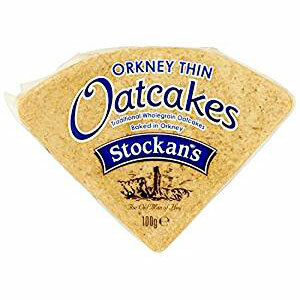 These oatcakes are the ultimate expression of the Scottish Pantry. The size, shape and thickness are all assets of flavor and texture, also, the packaging has brought the oatcakes door to door with no breakage. Terrific keeping quality. My guests (who shared in the oatcakes) have hounded me with requests for sources to be able to buy them on their own. (I, of course, told them about your company), They are addictive. and, so so healthy for such an addiction. There are similar products on the market (sort of), NOTHING comes close to the texture and taste of these. Keep the oatcakes available. The list of aficionados is getting longer. Love them! Strong oat flavor. 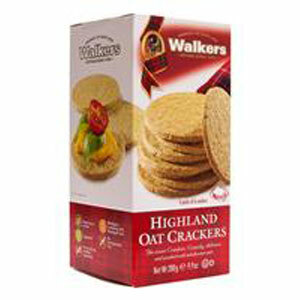 They are the same oatcakes we snacked on in Ireland and Scotland; brings back wonderful memories.